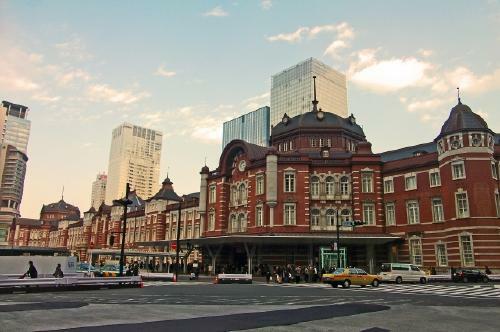 The Tokyo Station Hotel reopened in October 3, 2012 after a long break. 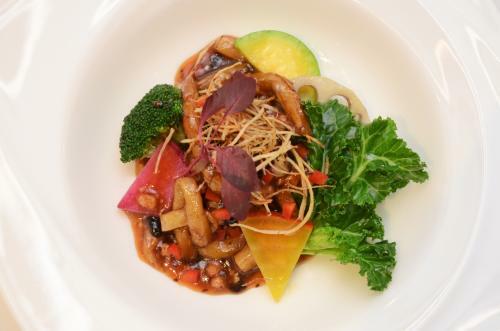 Do you know a restaurant in the Tokyo Station Hotel serving authentic Cantonese vegetarian course menus? It is called “Cantonese en KEN TAKASE”. 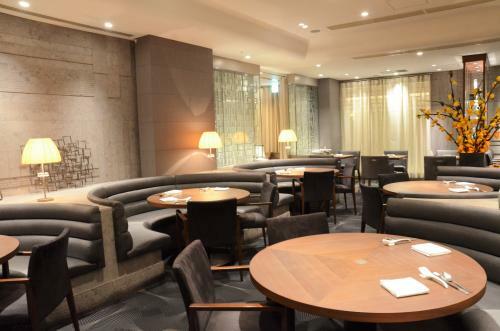 It is a top restaurant whose chef is a Cantonese cuisine specialist Mr.Kenichi Takase who had been the first head chef of famous restaurant, Cantonese Dining SENSE in the Mandarin Oriental Hotel for 7 years. The dishes of its Cantonese vegetarian courses including Chinese traditional “mock foods” look very beautiful using a plenty of vegetables. We interviewed Mr.Takase and the manager, Mr.Osamu Konno this time. They told us about their vegetarian courses which we want to experience at least once in our life and the chef’s passion about Cantonese cuisine. Click here for location and detailed information on Cantonese en KEN TAKASE. 3 Serious and superb “mock food”. Let’s check its impressive vegetarian course menu! When we talk about Tokyo Station, we would imagine this building first. The Tokyo Station Hotel is located inside this iconic Tokyo Station building. 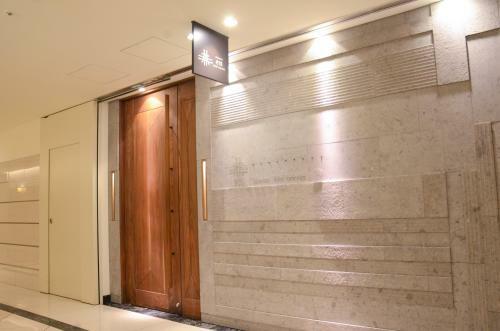 When you go through the Marunouch South Gate of JR Tokyo Station, the stairs leading to the basement floor of Tokyo Station Hotel appear. You will find “Cantonese en KEN TAKASE” where we had an interview this time after going down these stairs. The restaurant with moderate lighting has a relaxing atmosphere. There are plenty of space between tables and we can enjoy meals and chatting with friends. 90% of their customers is female. This is not only because of its luxurious atmosphere but also because of its uniqueness for healthy authentic Cantonese food. Not only regular course menus but also vegetarian course menus are available in the standard menu. People can enjoy Cantonese cuisine prepared mainly with vegetables. The first dish we will introduce is its signature dish “Buddha Jump Over the Wall”. 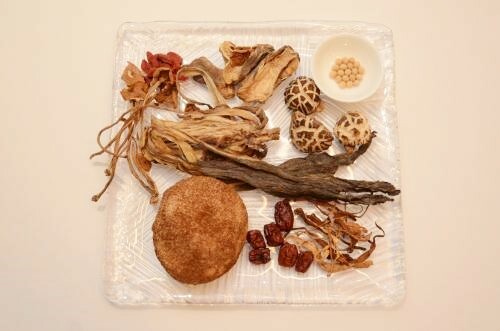 It is a Chinese medicinal soup cooked with plenty of Chinese dried foods. “There is a story about this soup. It is said that the soup was too delicious not to taste and monks stole it to have it. Since the original Chinese Buddha Jump Over the Wall soup contained shark fin and abalone, the monks were not allowed to have it. However, the taste was so irresistible even the monks broke their rules. 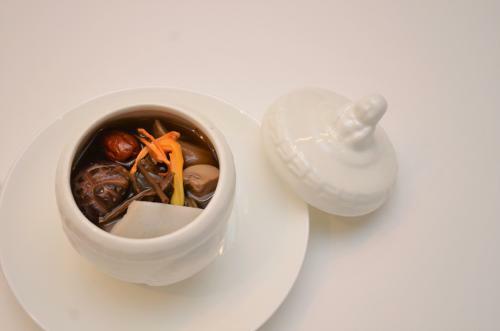 Our Buddha Jump Over the Wall soup is adapted to vegetarian. Thus, monks can taste it without breaking their rules.” said Mr.Konno. For its seasoning, simply only salt is used. However, the soup absorbed the tastes of those dried ingredients looks delicious! Look at the color showing its rich flavor. You can taste this soup in some course menus such as a vegetarian dinner course. It is also in the a la carte menu. Serious and superb “mock food”. Let’s check its impressive vegetarian course menu! Now let’s see some dishes from the authentic Cantonese vegetarian course menus. This is “Soy Meat and Seasonal Vegetable Sweet and Sour Pork Style with Sweet Chinkiang Black Vinegar and Pomegranate Vinegar Sauce”. 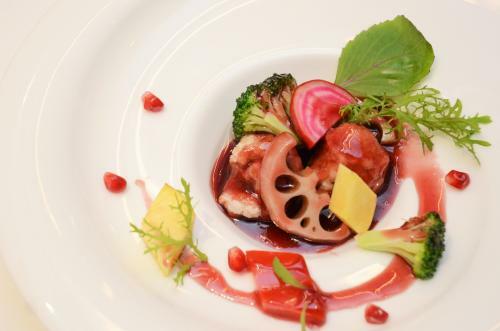 It is served in the vegetarian lunch course, HEALTHY SWALLOW (3,800 yen excluding tax). This mock sweet and sour pork is using soy meat. The black vinegar is very special, 8 year matured Chinese Chinkiang black vinegar. We also should not forget mentioning the use of pomegranate juice. Colorful vegetables and bright sauce create a beautiful dish! Despite of using soy meat, it looks just like sweet and sour pork. This dish from the vegetarian dinner course, GREEN SWALLOW (8,800 yen excluding tax) is “Deep-fried Tofu and Egg Plant Served with Stewed Soy Meat Chili Bean Starchy Sauce”. The starchy sauce contains soy meat instead of minced meat. Soybean adds flavors and makes the dish filling. This dish also has a plenty of seasonal vegetables. The Cantonese en KEN TAKASE prepares homemade original sauces. To make the most of the taste, they choose ingredients including soy meat which have less added flavors. 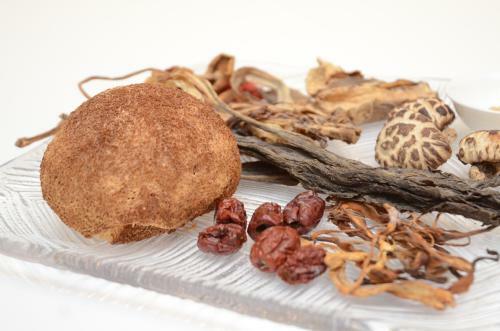 Well-balanced tastes of ingredients and seasonings are also one of the advantages of Chinese cuisine. Many other seasonal vegetable dishes are available. 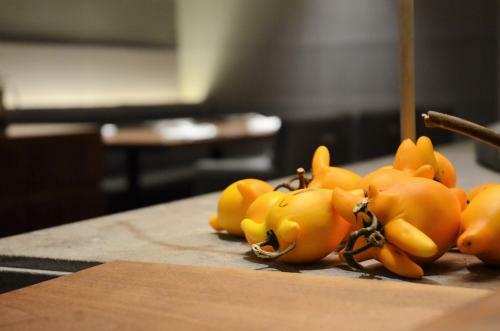 If you ask them in advance, they can serve not only vegetarian dishes but also dishes containing no five plants to avoid (Gogyo/Gokun) for oriental vegetarians. Mr.Takase has never stopped his research for new seasonings and ingredients and we can find always something new in his menus. 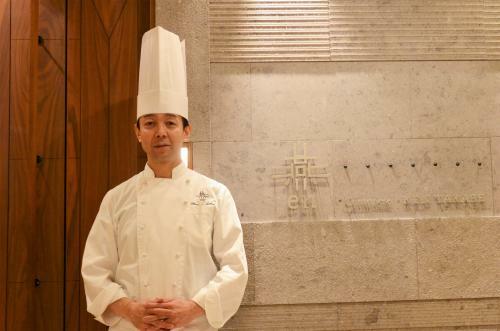 Mr. Takase is a Chinese cuisine chef specializing in Cantonese cuisine developed in the southern China. He said that he was not interested in other cuisines. Mr.Takase said that Cantonese cuisine is like Kyo Ryori in Japan. 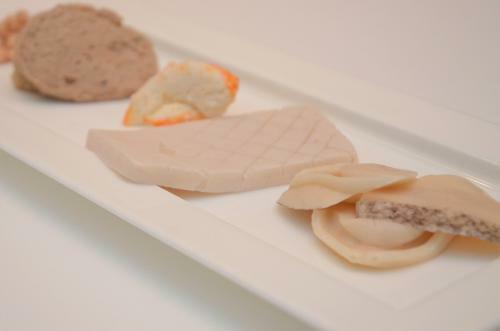 “I think the pinnacle of Japanese cuisine today is Kaiseki of Kyo Ryori. Kyo Ryori also makes the most of cooking techniques of Japanese cuisine. Mr.Takase trained in Canton and Hong Kong. He also learnt Cantonese cuisine in many famous hotels in Japan and has established his recipes. You may think that Chinese cuisine has no seasonality since there are a variety of ingredients and various climates in China. Mr.Takase said, however, Chinse cuisine also has seasonality. “Many people misunderstand it. In fact, Chinese cuisine has also seasonal dishes.